Confession: normally when I see a recipe starting with a tin of biscuit dough, I quickly turn the page. They just don’t taste like real biscuits in my opinion, and many of them contain trans fats and ingredients I can’t pronounce. But I saw this recipe for Shrimp Puffs in Food Network Magazine on two occasions, and I kept thinking about how much my daughter Samantha would like them. And I seem to have a weakness for recipes that call for fresh dill. Once I tracked down a tin of biscuit dough without any funky ingredients (Pillsbury‘s Simply brand), I decided to give it a go. I had a larger tin of biscuits than the recipe called for, so my youngest kitchen helper Lauren broke eight pieces of dough into thirds and then we pressed them into all 24 mini muffin tins (the recipe states 20). Even with this change, there was a ton of the shrimp-cheese filling, so we didn’t need all of it. I had chives on hand (and thought they would go over well with the kids) so I used those instead of scallions. 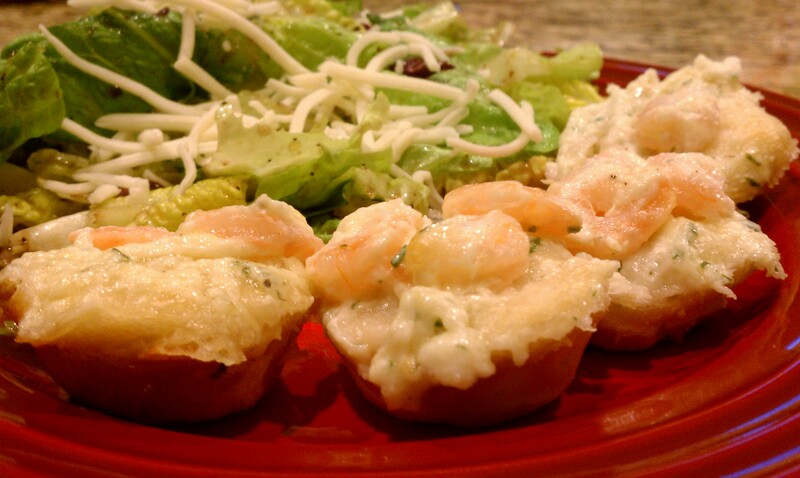 As expected, Samantha loved these cheesy shrimp-topped biscuits. So did my husband. Lauren adores plain biscuits and was not happy about having shrimp stuck to the top of them…she was looking around for her usual strawberry jam. And not surprisingly, I thought they were “okay”. They would be a good party snack, but we had them with a big salad for a quick weeknight dinner. Even though they weren’t my favorite creation to date, I will make these again since Samantha enjoyed them so much (and Lauren had a lot of fun “helping” with the dough).